Moonshifted is book 2 in the Edie Spence series. I read book one awhile back and enjoyed that the leading lady is a human nurse dealing with a bunch of paranormal beings. I wound up grabbing the audiobook of this installment from the library and I'm so glad I did. This time around we're dealing heavily with the werewolves and a bit about vampires. And man Edie Spence manages to always get in trouble. 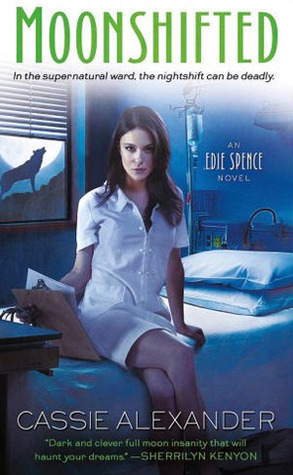 Edie Spence is a nurse in the Y4 wing of the hospital, her floor handles all the paranormal beings that humans know nothing about. While out with a coworker they see a man get hit by a car and find out he's a werewolf. After rushing him back to their floor of the hospital and stabilizing him they find out he's not just any werewolf, he's the alpha of the local pack. There is a power struggle going on amongst the werewolves and Edie is smack dab in the middle of it all. She's having to pick which side to trust but has no proof that it's the right choice until possibly too late. If that's not enough, she's also dealing with the vampire she helped save in book one as well as issues with her brother. Moonshifted was a delight to read and I cannot wait to get my hands on the next book. It does leave off where the series could have ended so I had to look up immediately to see if there was another book. I'm glad there is since I can't seem to get enough. It's really refreshing to read an Urban Fantasy book with a human character dealing with paranormal beings. I feel like most of the books in this genre have a paranormal being as the leading character and they wind up being super powerful by the end of the series. I do like how this installment revolves around the werewolves, with some vampire action on the side. It helped get a firmer grip on the paranormal aspects of the series since book one was about the vampires. All in all, this was a solid addition to the series and I'd recommend it to anyone looking for a good Urban Fantasy read. I'm really enjoying the series so far! I was just thinking about this the other day, did it end in book 3? Looks like there are 5 books at least so far! Oh I remember book one. These do sound neat. Very cool your library would have them! A different take on the genre. This one sounds like something I might like. hmmmmm, maybe I'll try this series again. Couldn't get into the first book, I should start with this one, lols. Pretty good, can't wait to see what happens next!